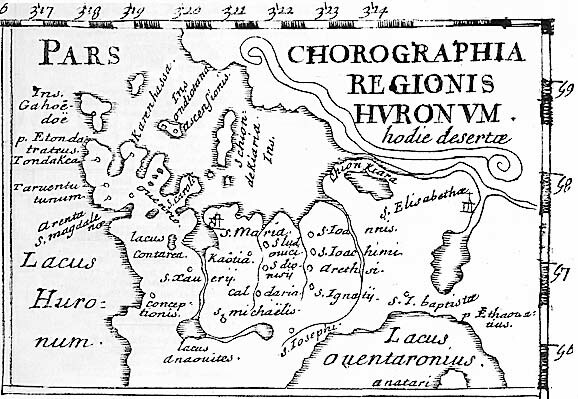 This year will mark the 400th anniversary of the arrival of Huronia’s first European tourist. It was in the fall of 1610 that Étienne Brule accompanied a group of Algonquin from the Ottawa Valley on their trek to Huronia to spend the winter with their allies. Brule was an indentured servant of Samuel de Champlain who had travelled to New France with his employer in 1608. He spent an arduous winter with Champlain at the Quebec settlement and went with him on his first venture against the Iroquois in the summer of 1609. Brule volunteered to overwinter at Quebec in 1609 while Champlain returned to France. In the spring of 1610 Brule accompanied Champlain on another incursion against the Iroquois along with the Algonquin, Montagnais and friendly Iroquois (later to be known as the Huron) at the mouth of the river of the Iroquois (now called the Richelieu River). After this bloody encounter these Nations had a rendezvous with Champlain where he expressed an interest in sending some of his men to live with these tribes in order to learn their customs and languages. Brule volunteered to go with the Algonquin tribe known as the Petite Nation whose chief was named Iroquet. This tribe lived on the river of the Algonquin (now known as the Ottawa River) south of Ottawa. It was the custom of Iroquet’s people to travel to Huronia and spent the winter with the Arendaronons (People of the Rock or Rock Nation) who were the part of the Huron Confederacy that resided between the Lakes Couchiching and Simcoe to the east and the Coldwater River to the west. Upon Brule’s return to Quebec in the spring of 1611 he informed Champlain of the whereabouts, customs and lifestyle of the “friendly Iroquois” with whom he had spent the winter as part of Iroquet's entourage. It was as a result of Brule’s glowing report of these people and their sedentary lifestyle that Champlain decided to champion an allegiance with them that would eventually lead to the Huron becoming the strongest trading partner of New France. One happy tourist changed Huronia forever.